Are you wasting energy by running your AC with a door open? Not with Alarm.com, you're not. Our new smart thermostat's technology puts an end to this age-old source of wasted energy. Parents, you'll have to find a new cliché to remind your kids to close the door, because "I'm not paying to cool down the whole neighborhood" has been officially retired. 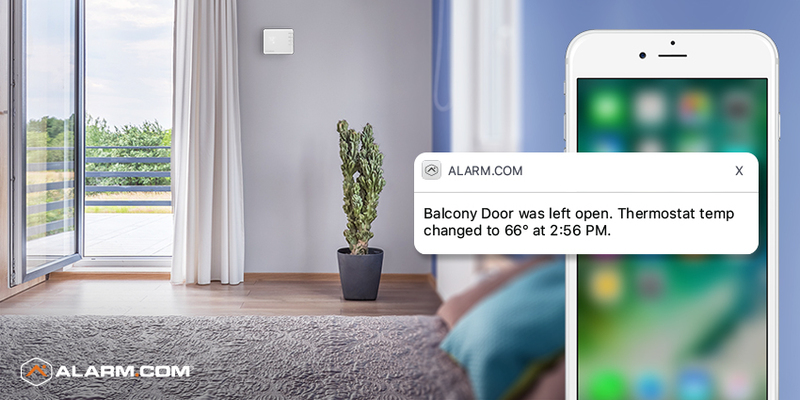 Unlike other smart thermostats, ours knows everything that's happening around your home, including when your doors and windows are open, thanks to the security system. When you open a door or window with a contact sensor on it, the thermostat is triggered to set back into ‘savings' mode. When you close the door or window, it triggers back into ‘comfort' mode. You can also have your thermostat send you an alert when a door or window is open, so that you can take care of it. The thermostat returns to ‘comfort' mode automatically afterwards. You can customize this feature too. You can put a delay on the front door auto-setback to account for people coming and going, so it only acts after five minutes or ten minutes or however long you prefer. You can also choose the ‘savings' mode you want by adjusting how many degrees the thermostat sets back by. No more cooling the neighborhood! It's a breathtakingly simple way to save energy, and yet no other smart thermostat can do it. They just don't have the intelligence – by which we mean real-time ‘knowledge' of activity inside and outside the home, which only a Smart Home Security system can provide. Want to know more? Meet our new Smart Thermostat here, or watch this quick video of how Alarm.com automates your whole home.